There were no footprints on the Robinson Lake trail. Then again, for most of the way, there was no Robinson Lake trail! I was hoping for some good spring snow but instead I had to wear snowshoes as soon as the snow was continuous (about 500' above the Onion Valley parking lot). The lake was completely snowed in and frozen over. Near University Pass I had to hop boulders because for some reason the snow there had melted out. The north side of the pass (which some call the east side) was good and solid at 8am, but by the time I topped out I was starting to punch through. The south side of University Pass was no picnic - my hopes of a glissade into Center Basin were extinguished at the pass. What little snow there was at the bottom was variable (half mush, half ice) and the top 800' was ugly loose rock and sand (better if you swing west of the main chute). My waypoints mark the top and bottom of the pass on both sides, with the caveat that while most people think of it as an east-west pass it actually is a north-south pass. I chose a line through the marshes and streams of Center Basin before leaving the talus field, but even so I wasted a lot of time going high enough to cross the streams on snowshoes. By noon the snow was so soft I was sinking past my ankles even with snowshoes, and occasionally punching through. I took a 3-hour siesta and had an early dinner, watching a fixed-wing glider drift above the eastern crest, then finishing my hike to the base of Forester Pass after the sun set and the snow hardened. Map of my Caltech and Stanford routes, from camp. I left camp shortly after 5am, hoping to make Caltech Peak before the snow got mushy. There's a break in the cliffs where the trail goes way east around a ridge (waypoint FORXC1) so I shaved off a mile or so compared to the trail's switchbacks. The snow sure wasn't what I had hoped for! I didn't even make it to Forester Pass without snowshoes. Of course, the south side of this pass was also melted out except for a patch of ice just large enough to make the top 100' deadly dangerous. 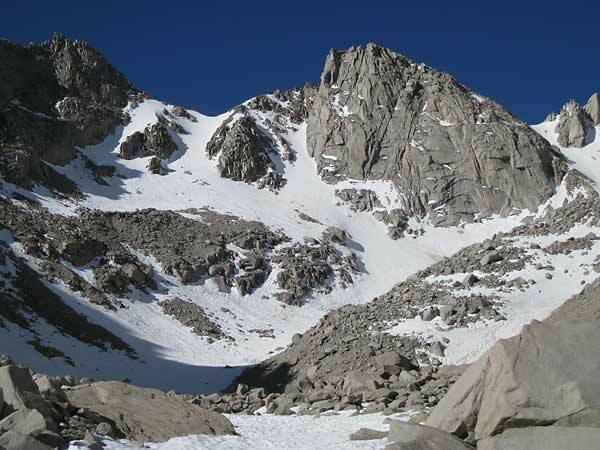 I rattled down the chute and across the frozen valley to the base of Caltech's east ridge. Secor says Caltech's east ridge is Class 3, but by angling up and south across the end of the ridge's shoulder I was able to keep it at Class 2. Even above the shoulder, where it narrows to an aesthetic knife edge, it's easy to avoid Class 3 by dodging a few feet to the left of the ridge occasionally. Of course, staying on a knife edge reminiscent of Palisade Crest is fun but it's not necessary. Definitely a Class 2 route. Definitely better than slogging up sand. Definitely not the way I planned to descend. East ridge of Caltech, ascent on the left, glissade on the right. The summit register was placed by a NPS ranger in 2007, with a note that the prior register might have been removed as part of a search-and-rescue operation. I was the first person up this year, and found the book in an ammo box near the fancy Sierra Register Committee clamshell (which was designed with no latch, so it seems insecure). It was in the 60s and dead calm on top, so I napped and waited for the snow to finish getting mushy. Descending only about 200' from the summit, I dropped into a snow chute and glissaded off the north side of the east ridge. Way faster than climbing down! On my way back up to Forester, I took the trail. I sometimes hear voices that aren't there when I've been out alone too long, but this time the voice was definitely there and definitely cursing the snow. It turned out to be Eric D, the first PCT through-hiker of the season. He had a pack smaller than my day pack and no snowshoes. He was catching me! He used my snowshoe tracks and my glissade tracks on the snowy north side of Forester. After chatting briefly at my slab-outcropping-in-the-snow campsite, Eric headed down Bubbs Creek on a mission. He has to average at least 35 miles per day to get from Mexico to Canada and back in the same season, which he has done before. The next day I got up even earlier, leaving camp before dawn. Secor describes the 'east face' route on Mt Stanford as ascending a chute. I could see that what I thought was that chute and it was packed full of rotten snow, unreasonably steep, and with a rock band across the middle probably forming a moat (blue line on the photo below). Maybe if I got there early enough I could climb it anyway. No such luck. Even pre-dawn, I had to wear snowshoes on slopes that measured 40 degrees (green line below). It was crampon-hard, but with soft spots where I punched through, so having MSR Lightning Ascent snowshoes with heel bails and sharp-metal-only contact on hard snow proved essential. 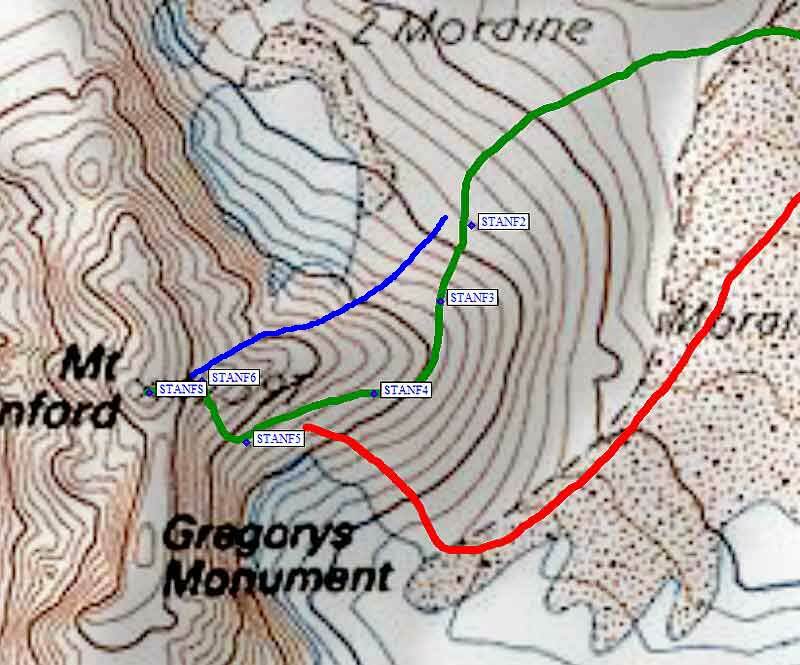 My old Denali Ascent and even older Sherpa Snowclaw snowshoes would never have done the job... but they might have gotten me around the ridge on the moraine (red line) to where I could climb 2nd class rubble and join the green line higher. Stanford from the northeast. 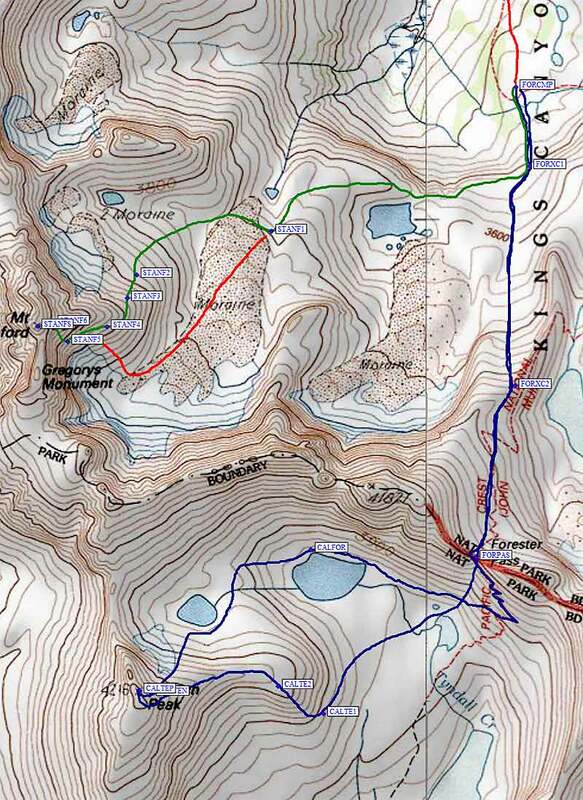 Green is my line (partly behind the ridge), blue is steep chute with rotten snow, red is moraine. Giving up on the 50-plus degree chute before I got there, I angled left around the end of Stanford's east ridge, crossing the ridge below where it goes Class 3. Hmmm. 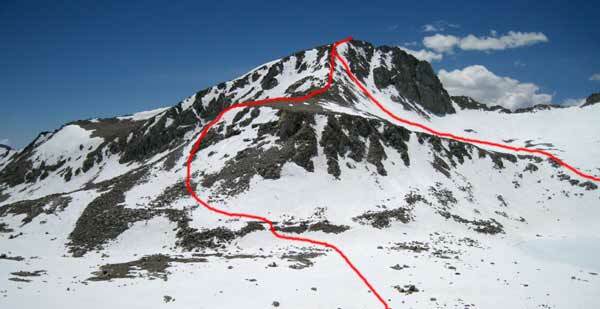 Maybe Secor's east face is actually a southeast chute, on the south side of the east ridge? It's definitely Class 2 either crossing the ridge around 13k (waypoint STANF3 on the green line) or staying down on the moraine and coming up closer to the bottom of the chute (the red line on the photo above and the map below). The ridge to Gregory's Monument. 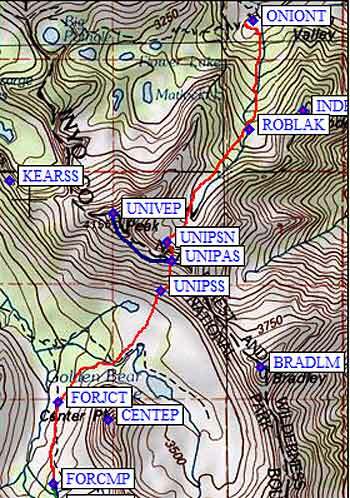 The USGS topo map appears completely wrong in this area. The Gregory's Monument ridge is nowhere near as wide as shown on the map, and there's a cliff band below much (but not all) of the east ridge's south side. Hmmm. I angled up and left, doing a big spiral, staying in Class 2 terrain at least until waypoint STANF5, somewhere around 13.5k. There I climbed more vertically into a chute immediately left of the base of a split white pinnacle (waypoint STANF6) that had been visible before I started climbing (at the top of the chute on the north side of the east ridge). 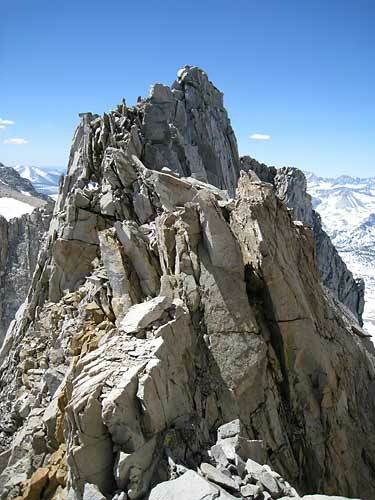 This pinnacle is probably the 'class 4 pillar' Secor says you must traverse on the 'east face' route. I got up beside it on the right, where the red and blue lines meet, but the other side (perhaps the normal route) was north-facing impossibly high angle icy/rotten snow that I dared not climb without a rope and belayer. (And I'm pretty brave when it comes to steep snow.) I couldn't get up to the saddle on its left side, which is where I was now sure I needed to be. After hunting around a bit, I found a ramp that traverses left from the base of the split pinnacle and goes under a rust-colored outcropping. This "Hail Mary" ramp ends around 13.7k in a chute full of friendly rubble and small ledges. From here it's straight up but very steep (measuring 60 degrees) to a saddle at 13.8k. This saddle is basically the top of the rust-colored outcropping, where the Gregory's monument route approaches the summit. From here you can look down on the wite split pinnacle, a direct route that might go just fine if it weren't choked with rotten snow. Having climbed Stanford via Gregory before, I already knew it was basic Class 3 from that saddle about 100' up to the summit. Magnified map of my Stanford route. I climbed the green line! I made it, but I'm still not sure where the 'east face' route is. Maybe only the top 200' is a face climb, and the rest is talus and a chute? The guidebook says you can climb a chute or the face left of it, but the face left of the chute I climbed is blank. The other chute would be the blue line on the photo above, the other side of the ridge I climbed. Maybe I climbed a new route? Dunno. See the map for where I was, let me know if you've climbed it differently! Stanford has a Colorado Mountain Club container and register! It was placed a couple years ago, and although it's a PVC pipe it hasn't seized up. Yet. Again I was the first climber of the season. Again I napped and killed a bunch of time admiring the view. No matter how long I waited, however, the steep chute with a rock band and moat in the middle was in no condition for a glissade. In more firm conditions, where you didn't risk losing your feet under the crust, it would be an epic glissade. This time it was wet-avalanche-mushy on top, with patches of ice and places you'd break through. I fought my way through some small patches to test it, then retraced my steps and glissaded the 35-40 degree slopes I had climbed in snowshoes. NOTE: The green line is where I climbed, the red line looks like it goes but I didn't do it that way. Back in camp, I ate and napped, again waiting for the snow to harden, then moved my pack over to the base of University Pass just as it got fully dark. A good choice, because the clouds which had been building each day stuck around all night. The next morning dawned cold and windy, but I managed to lug my pack to the pass and dash over to University Peak before the wind got dangerous. Center Basin from University Pass, at dawn with a storm coming. A very tough glissade (again, mush on the top and crust that threatened to trap my feet and send me tumbling) got me to the bottom of University Pass just as the wind started gusting strong enough to knock me down. Boulder hopping toward Robinson Lake required sitting down quickly and waiting out the gusts when I heard them coming. Over a foot of snow had melted while I was away, so I actually got to walk on the Robinson Lake trail a little bit on the way out. Near the parking lot it was just a river, not really looking like a trail, so I startled some tourists when I showed up wading in a foot of water and way over-dressed. Packing my car in the parking lot I noticed a single backpacker coming down from Kearsarge Pass. It turned out to be Claire, the only other PCT through hiker to make it this far north. She had been passed by Eric the day before I met him, and was headed out to Independence for supplies. She got a ride, I got lunch, and the storm closed in behind us. I understand it snowed a foot in the next couple of days, with winds topping 70mph on the crest. It was good to be back at the coast for that part!